First and foremost, before we get to anything else. That cover. I love it. 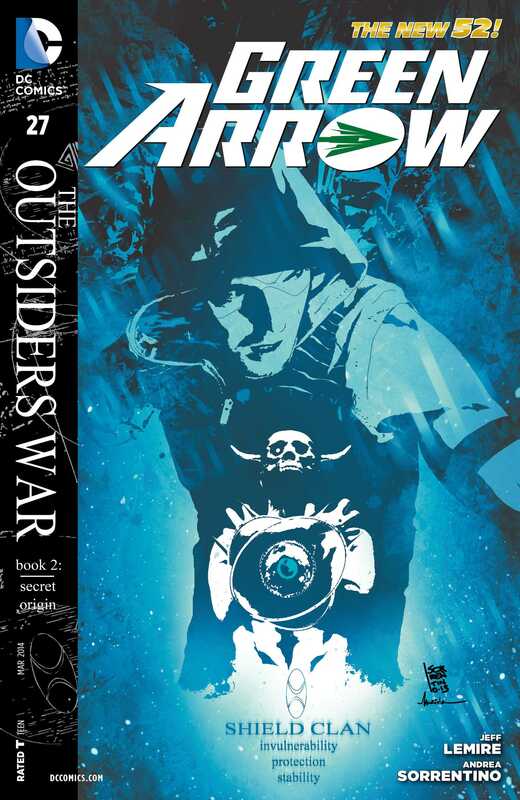 Each cover for the Outsiders War arc is particularly themed and I just can’t say enough good things about the work that Andrea and Marcelo are doing with these. The cover for Green Arrow #26 was pretty damn great and the new cover is more of the same. I have half a mind to start collecting these comics in print, just because of these amazing covers, but also because of the great artwork inside, more on that later. The story itself picks off pretty much where we left off in the previous issue. Ollie is back on The Island, and this time he has Shado to guide him, both metaphorically and otherwise. She’s recently taken over a sort of a mentoring role to him, although not quite, and she continues in that same vein in this issue and she forces Ollie to confront some harsh truths about his time on the island and all the mysteries that he was exposed to here, and what all their consequences are. Ollie himself continues to rail against everything she tells him, perhaps because he’s not ready to believe the conclusions, but also because he stills bears the scars of this place and would perhaps prefer not to be here. But then that’s the fun of this issue. There is an incredible amount of character drama here. Ollie is conflicted with himself and also with Shado. That’s one of the best parts of the script. And Jeff Lemire also includes some truly awesome action sequences. The Shield Clan of the Outsiders is now in play and they have been sent to deal with both him and with Shado. I haven’t read Jeff’s run from the beginning (issue #17 I think), so I’m not sure exactly what all the connections are here, but I’m definitely enjoying the mystery aspects of the comic. They are keeping me hooked. And the cliffhanger ending of this issue is totally jaw-dropping. Extremely unexpected, but also quite logical. What I love also is that there are some strong ties between the comic and CW’s Arrow. There are a few scenes here and there that are repeated from the show, but reworked to fit the story of the comic and the adaptation gels with everything really nicely. There are a ton of differences between the story in the show and the story in the comic, but they are all still headed along the same path, more or less, and that advancement is what really hooks you in. Separate continuities, but synergised. Like I said, there aren’t enough good things to be said about Andrea and Marcelo’s work with this series. This issue proves that. Again. Its almost as if these guys can do no wrong and being on this incredible ride with them is an absolute joy. Aside from Batgirl, Afterlife With Archie, Red Sonja, Black Science, Samurai Jack, and a few other comics, there isn’t any other series that I’m enjoying so much because of the art. There is an incredible fluidity to Andrea’s pencils/inks that is perfectly realised and then enhanced by Marcelo’s colours. Ollie doing a floor-slide to avoid a thrown shield and then shooting the Shield Clan stooge who threw it, Ollie using his array of trick arrows, his fight against Shield Clan’s leader Kodiak, and everything else in this issue was just perfect. And not just all that, but the creators also managed to work in Tatsu Toro aka Katana into the issue as well. She was introduced in 2011-2012 as a member of the relaunched Birds of Prey and then joined the Justice League of America as a founding member. Her status right now is uncertain since in the big scheme of things she is caught up in the events of Forever Evil and her own solo book is now cancelled. So its great to see her come back here. Overall, this was a pretty much perfect issue and I have no complaints. The team has started off the year on a great high. More Green Arrow: #24, #25, #26. Posted on January 9, 2014, in Comics Reviews, Review Central and tagged Andrea Sorrentino, Archery, Arrow, Comics, Comics Review, DC Comics, Green Arrow, Jeff Lemire, Marcelo Maiolo, New 52, Oliver Queen, Review, Review Central, Rob Leigh, Shado, Superheroes, The Outsiders War. Bookmark the permalink. 5 Comments.